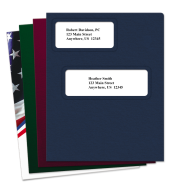 The Mines Press carries a collection of tax return folders that will dress up your work and deliver the professional image that your clients expect. We offer the largest assortment of tax folders for accountants available online today. And, they are all backed by our 100% satisfaction guarantee. We've been providing printing solutions for the accounting industry for over 80 years. This vast experience has led us to put together a selection of tax folders that will allow you to find the best fit for your company. 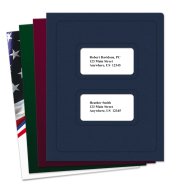 Our varied collection includes top-quality personalized foil-stamped and printed tax return folders, as well as non-personalized folders that will still give you the opportunity to add a personal touch simply by adding your business card in the inside sleeve. 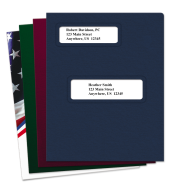 All folders come with multiple options for stock, style and color. But that's not all! 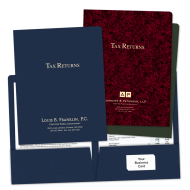 We also carry a complete collection of tax return folders that are compatible with all the tax preparation software programs that are being used today in the accounting industry.